MasonrySaver Decorative Concrete Sealer is a non-yellowing acrylic polymer blend sealer formulated for use on properly cured concrete surfaces. Designed for use on both interior and exterior concrete, MasonrySaver Decorative Concrete Sealer is suitable for use on a variety of surfaces where a durable gloss finish is desired including concrete patios, driveways, sidewalks and even garage floors. 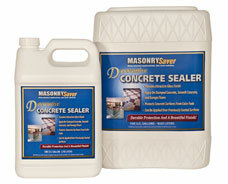 MasonrySaver Decorative Concrete Sealer dust proofs concrete with a durable acrylic blend resin. On surfaces that have been previously stained using MasonrySaver No-Rinse Acid Etching Stain, MasonrySaver Decorative Concrete Sealer leaves an attractive, non-yellowing durable gloss finish that protects concrete from damage and color loss due to ultra-violet light, moisture and abrasion/wear. LIMITATIONS: Not suitable for use over asphalt surfaces. This product is designed for use on horizontal or vertical surfaces. Do not use on below-grade surfaces that are subject to severe hydro-static pressures. When using in areas subjected to hot tire traffic, allow adequate time for product to cure before putting the area back into surface. When applying over previous coating, hot tire resistance maybe compromised. Do not use if the area will be exposed to softer, high performance tires. When MasonrySaver Decorative Concrete Sealer begins to appear worn from the surface, a single coat of material may be applied once surface has been properly prepared. For surfaces that have been waxed, follow the waxing product's label directions for maintaining the waxed surface. Avoid applying maintenance coat more frequently than every 18 – 24 months to avoid excessive build-up of material on surface. When build-up of product does become excessive, surface should be thoroughly stripped of product followed by application of two coats of material. Dry Time: 4-6 hours for foot traffic, 4 days for automobiles. Allow 48 hours before waxing.